Monster Hunter 3 Ultimate (or Tri, even; they’re similar enough) presents a cooperative experience that feels more cohesive, and more cooperative than anything I’ve played before. I absolutely love games like Crackdown where you jump about a massive city, wreaking havoc and just having a grand ol’ time. While those sorts of experience are enjoyable, they’re more like “hanging out” with a buddy in a game world than really cooperating. In a game like Army of Two or Hunted: The Demon’s Forge you have a world designed around specific cooperative mechanics where you can’t help but work together. While these experiences do rely on teamwork, they’re definitely much more forced, which can bring you out of the game. Since the dawn of gaming, players have been able to play together on the same team, but Monster Hunter 3’s co-op is the first game I’ve played where a friend’s virtual presence has changed the experience into an entirely different thing. As a disclaimer, Monster Hunter as a franchise has had co-op since its inception, but I haven’t played them and can’t speak to their quality. The following pertains Monster Hunter 3, even if the ideas submitted by this particular edition aren’t entirely revolutionary. Monster Hunter is one of the least creative titles for a game I know of; the game is literally about hunting monsters and the aspects related to said objective. As a hunter visiting Moga Village, you’re tasked with “saving” the citizens from the Lagiacrus, a giant lightning-wielding serpent who’s been encroaching the town. Starting with almost nothing, you must travel into the forest to hunt monsters and bring back crafting materials for yourself, as well as resources for the village. After a few hours of exposition and acclimation to the rather daunting systems in the game, you’ll be able to indulge in multiplayer (online on the Wii U and local on the 3DS). While technically you can join in the multiplayer immediately, doing so that early in the game will leave you unable to complete even the easiest of cooperative quests. I mention this development because it’s part of building the cooperative experience. The first big monster you can hunt in multiplayer is the Qurupeco, a large bipedal bird with wings lined with flint, which grant it painful fire attacks. However, there’s a monster you fight before getting to the Qurupeco called the Great Jaggi, a large raptor-like creature who summons minions to swarm you. Tackling this solo, no matter what weapon you choose (we’ll get into that), is pretty intimidating, especially if you’ve never played a Monster Hunter game before. The game sets up the undeniable fact that these monsters can and will kill you– especially if you get careless–and there’s no way you’ll be able to completely shut down an appropriately challenging monster without help. Sure, you can play the whole game solo, and you can beat the monsters solo, but there’s a very clear perception of how hard things are without a buddy. One of the reasons it’s difficult to work every angle of a monster is due to the wide variety of weapons and their respective limitations. The game features twelve weapons ranging from small blades to massive hammers for melee, bows and guns for long-ranged attacks, and even a battle horn primarily designed for support. While obviously a weapon like the horn is mechanically designed for cooperation, even the conventional weapons are incapable of defeating monsters in the same way; each one plays differently. For instance the Lance and Gunlance have powerful, quick anti-air attacks but are horribly under-equipped to deal with horizontal movement. The hammer hits very hard and is great for stunning monsters, but involves a lot of positioning and risk when going in for a big attack. Each weapon is so defined in its characteristics that you’re bound to hate some and love others, and your friend will likely choose weapons different from yours. Some weapons synergize well, but none of them (beyond the horn) feel forced. Each weapon feels justifiably limited in its size or functionality. Ergo from its onset, Monster Hunter 3 establishes with the player that they cannot do everything, and there is a definite understanding of what an additional person can bring to the table. This is an incredibly important aspect of a cooperative experience. While it’s almost always fun to play a game with a friend, when a partner has a purposeful involvement in the experience, the cooperation is tangible rather than suggested. Instead of the game showing you that your friend is there and that they’re participating, you’re seeing the direct results of their influence on the game in a way that, due to your equipment and its limitations, it’s difficult to imagine being without. A player with a hammer has to kite, or lead, a quicker monster until an opportunity shows up, then quickly capitalize. However, when assisted by a Bow/Gun-wielding player who can inflict status ailments like paralysis or sleep, the hammer player is given a much wider window. There are millions of permutations of such instances, but the general takeaway from cooperating in Monster Hunter 3 is this: everybody’s input matters, and by playing the way they want, players can provide something different and helpful to the battle. There’s more to a cooperative experience than just the action and the minute-to-minute, however, and Monster Hunter 3 inspires something genuine in its “meta-game”. There’s a massive variety of armor and weapons to forge and most of it requires materials from each of the various monsters in the game. This means that as players endeavor to create specific pieces of armor or weaponry, or even craft certain consumables, they must decide as a team what to hunt for. This creates a lot of game-centric discussion including who should bring what, what’s being hunted and why, and how these elements will contribute to future and more difficult hunts. Rather than simply doing “whatever” ’cause “who cares,” every decision is important and time spent gathering or hunting is very purposeful. While many games, especially MMOs, encourage discussion regarding group preparation in dealing with a specific encounter, Monster Hunter 3′s emphasis on multifaceted monsters and hunters alike creates dozens of solutions, heavily influenced by player agency. You may not like the Wii U’s interface or Nintendo’s approach to online play, and you may not like confusing systems. Hell, you may not even like monsters, but Monster Hunter 3‘s cooperative gameplay is a marvel. 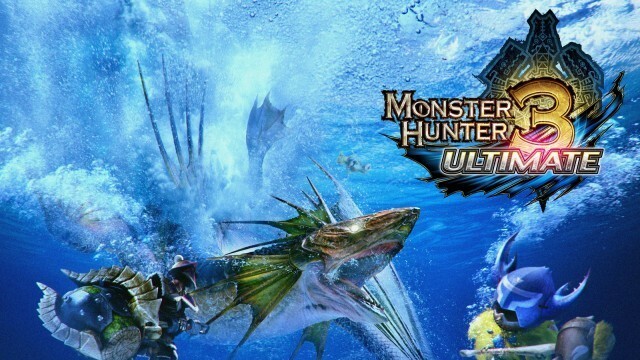 There are a ton of great co-op games out there to suit all kinds, but few are as engrossing as Monster Hunter 3 Ultimate. Giving players an impression that they can win while showing them just how much more they can do as a team is a genius move on Capcom’s part. Variety is always important in co-op, but truly unique options are rare (and often don’t work), so to haveplenty of choices at your disposal exemplifies the true essence of cooperative games. I hope future cooperative games can implement similar concepts to craft more impressive and engaging experiences.